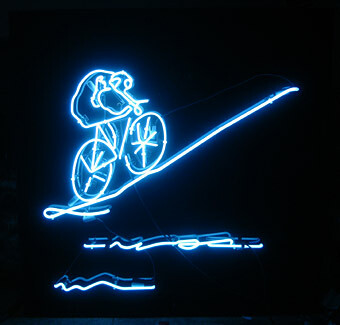 Rainer Ganahl’s video The Apprentice in the Sun shows one of his precarious bicycle rides performed against ferocious city traffic (this time in Bucharest), presented along with a neon work inspired by a Marcel Duchamp drawing with the same title. 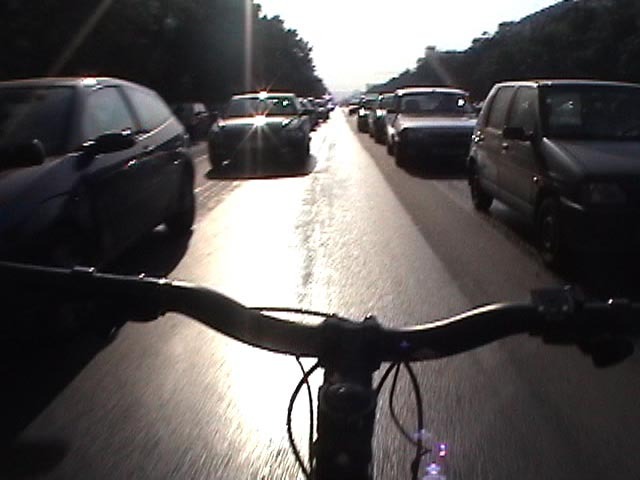 The Bucharest ride is one in an ongoing series of “performative exercises,” in which Ganahl cycles between two historically and politically significant locations in a metropolis, always against motorized traffic and in an utterly vulnerable position as he is riding free-handed while holding his camera above. Ganahl is like a Tour de France rider who has taken a very wrong turn, or a stuntman who has inexplicably moved from the circus into the city. 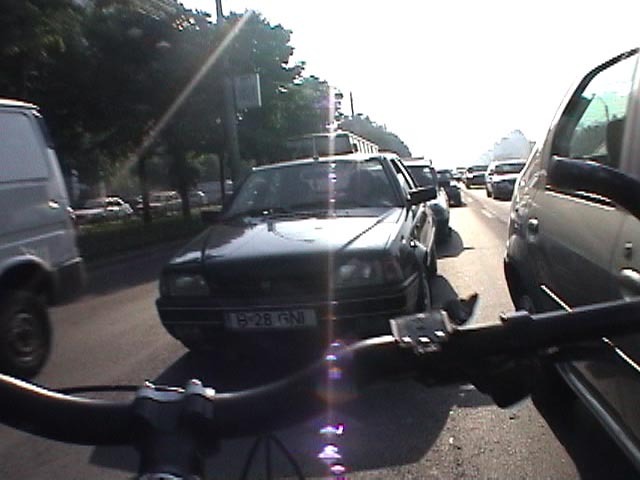 Going against the grain as a Western visitor in post-Cold War Romania also highlights the prevalence of intercultural misunderstanding in this era, but what’s most alarming (and darkly humorous) is how a simple bicycle trip becomes a life-threatening act. Ganahl’s work also subtly calls for risk-taking and new directions in both an ecological and political sense. All of the works in this exhibition involve degrees of agitation, sometimes rendered subtly, and sometimes more overtly. 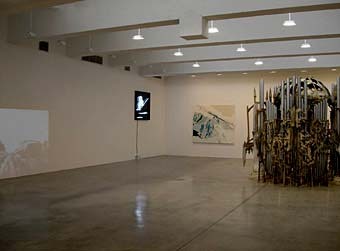 While the exhibition does not directly address some of the overwhelming issues which make this such an anxious era⎯a grinding war, rising intimations of ecological upheaval, violence as a routine form of intercultural politics, economic travails⎯it is informed by them and by others; this is an agitated exhibition for an agitated time in which wavering hopefulness is accompanied by constant, nagging dread. However, each work in this exhibition also couples agitation with repose; there is quiescence in this commotion, grace and calm emerging from works and situations that are otherwise nervous and unruly. As curators, we were especially interested in vivid, highly idiosyncratic works as well as in the unexpected dialogues and correspondences that develop between those works, even, or perhaps especially, when they don’t inhabit a similar terrain or share a related esthetic. The exhibition opens with As Time Goes By, a whimsical “relativistic” sculpture by Via Lewandowsky. An office clock displays actual time, yet on a frantically spinning clock face that moves endlessly counterclockwise. Time marches inexorably forward, but simultaneously spins backwards; Lewandowsky’s work also intersects with a current situation in which contemporaneity is imbued with ancient influences and conflicts dating back hundreds of years. Lewandowsky’s doctored clock scrambles and destabilizes our ingrained notions of time as an orderly, mathematical progression, while it turns something so familiar as a typical clock on the wall into a wild card and provocative object. Instead of “telling time” this new clock asks difficult questions about our orientation to time altogether. Ragna Róbertsdóttir frequently ventures to some of the more agitated (as well as mind-bending and awe-inspiring) landscapes on earth⎯the active volcanoes in Iceland’s interior. There, she gathers black pumice, which she later cleans and sorts in her Reykjavik studio. Her large-scale wall work consists of thousands of these lava chips affixed to the glue-covered wall. While strictly abstract, this work contains hints of landscape painting and it also suggests convulsive volcanic eruptions, such as periodically happen in Iceland (and elsewhere), resulting in chaos, destruction, and death. 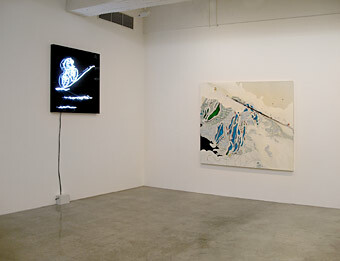 At the same time, Róbertsdóttir’s wall work is peaceful, meditative, and frankly sublime. Diana Al-Hadid’s Portal to a Black Hole conflates the “heavenly” sounds of a pipe organ and a black hole in a playfully fragmented and tainted, yet soundless sculpture. At the core of the structure is an architectural and musical interpretation of a black hole, rendered in the form of a spiral staircase beset with pipe organ keys. Black holes (such as in the Perseus A galaxy) exude pressure waves that are known to reverberate in B flat, the lowest note in the universe, which is 57 octaves lower than a middle C and impossible to perceive by a human ear. Al-Hadid builds history around this tone like a shrine around a reliquary⎯in a form of flawed Greek columns, Gothic windows, a Baroque dome, and industrial-looking organ pipes which (silently) leak out black sound—all in an allegro of decay. Sculpting scientific fact into the holiest devotional subject, Al-Hadid vigorously launches mythology, sacral architecture, and liturgy into the space age. Besides, if Earth came close to a black hole our tiny planet would be gobbled up in no time, along with all the cultural and scientific achievements of our comparatively short existence. Roman Signer exhibits six videos of his signature sculptures-as-events, temporary (and oftentimes extremely brief), yet agitated and cathartic incidents that only come to the audience via video or photographic documentation. In one work, the artist sits outdoors in front of a canvas on an easel; he’s a plein air painter intent on depicting the beauty of nature. Behind him a fiery device on the ground starts hissing and spewing smoke; when it explodes with a loud bang Signer flinches and makes an involuntary calligraphic mark on the canvas: that’s his “painting.” In another work, Signer is asleep in a bed. Suddenly, a sizable toy helicopter flies into the room, moves close to Signer’s head and then nervously retreats, like a wild creature at once curious and wary, or perhaps like a nightmare sprung to life. All six sculptures mix an air of quasi-scientific research (although of a decidedly homemade variety) with an impish, pranksterish humor. While doing so, they reveal an uncanny ability to directly incorporate elemental and even world-shaping forces, such as speed, time, friction, gravity, momentum, and erosion, and they are also inordinately touching, with peculiar combinations of ungainliness and grace, claustrophobic restriction and ecstatic exhilaration. Jon McCafferty’s multi-layered and tumultuous paintings of abstracted mountains suggest both geological and psychological commotion while subtly revealing composure and an inner logic of cause and effect. The mountainous shapes are based on topographical models that the artist builds and then renders in painting. The dynamics developing in form, color, and composition expose (and hide) layers of thought⎯reflections on a host of topics, including philosophy, art history, politics, environmental issues, and personal experience, to name just a few. The works are ultimately landscapes of an agile mind in a time of upheaval. Upstairs, Via Lewandowsky’s sculpture of two “copulating” prefab houses evokes urban claustrophobia, conformity, and forced intimacy as acceptable forms of repose. As the two houses jut into one another, they are willfully awkward and ungainly, and they conjure irritation and violence. At the same time they are oddly elegant, even graceful. Lewandowsky’s work was inspired by the problematic experience of German reunification, but it equally responds to numerous other examples of national and cultural division, coupled with fractious attempts at unity. Nearby, Lewandowsky’s sculpture of a stuffed parrot, birdcage, and pedestal, all cut into two mirroring sections, turns the pleasant situation of a bright bird in a cage into something startling and provocative. This divided bird suggests split selves and riven nations, but it is also curiously stately and alluring. Claire Watkins’s delicate kinetic wall sculptures recall twigs and tree branches, but also the body’s nervous systems, notably the brain’s own architecture. Tiny, exquisitely crafted systems of cast bronze parts, wires, lights, magnets, and electrical impulses amount to a “portrait” of the artist’s own brain, as she gets a thought (perhaps even an exceedingly mundane thought) and then processes this information through her own elaborate circuitry. Watkins’s sculptures constantly shift and twitch, albeit slowly and subtly, making for an extraordinary mix of motion and stasis. As one observes her fluctuating system, one reflects on consciousness altogether, on how multiple thoughts move through the brain simultaneously, and on how big insights get thoroughly mixed with an endless flow of miscellaneous other information. In Unseen, Holly Zausner’s new 16mm film, the questing artist hurries through key locations and art sanctuaries in the city of Berlin attempting to find metaphorical space and literal rest for two dangling figurative rubber sculptures, one female and one male. As Zausner and her two rubbery protagonists (which may also be friends or lovers) move through the city, a non-linear narrative unfolds. They encounter sites central to the life of the city, like a bread factory and a newspaper plant, but also oddities, like a defunct amusement park. A skywriting plane spells out the word “unseen” above the city and a storefront window (Zausner’s gallery) explodes onto the street. Airports, train stations, and large avenues are curiously empty of people, a real tiger patrols through a sculpture park, and the carved Baroque Saint statues in Berlin’s Bode Museum seem to eye Zausner and her two companions with looks of consternation, empathy, and care. Evocative dialogues result⎯between urban environment and art, body and production, instinct and will⎯while a strong sense of displacement and unrest alternates with a sense of belonging and temporary repose.